Mix by hand the ground beef, water, bread crumbs, garlic, onion, egg and salt & pepper. Shape into 18 meatballs and place on a baking sheet. Bake for 15-20 minutes or until cooked through. Meanwhile, heat the sauce over medium heat on the stovetop. Add the meatballs and cook until heated through, stirring occasionally. 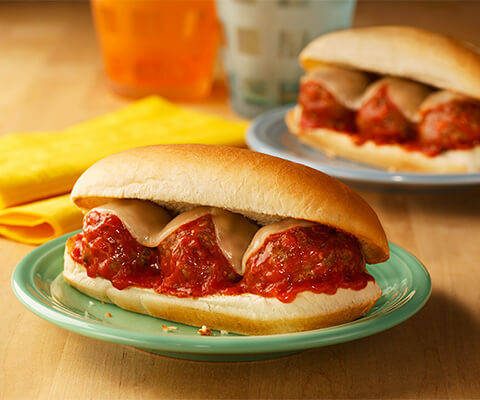 Spoon 3 meatballs and sauce onto each roll and top with 2 cheese slices. Bake an additional 2-3 minutes or until the cheese is melted.